Where do you make your mattresses? Will my mattress make me hot when I sleep? Is there an adjustment period for my new mattress? 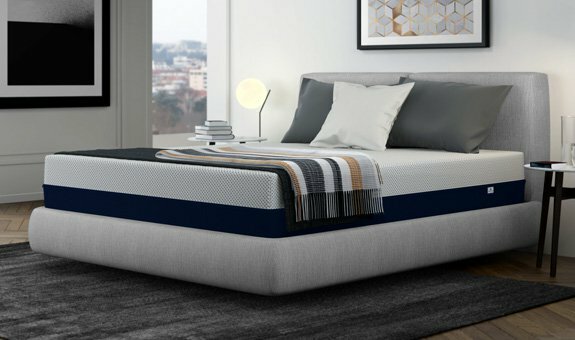 What do I need to do to care for my new mattress? Can I return my mattress if I do not like it? How can I pay for my mattress? How long will it take to get my mattress? How do I give my mattress the best support? Can I use my box-springs with your mattress? Does compressing the mattress for shipment cause any damage? No. We designed our mattresses to keep you cool and comfortable all night. But we get this question a lot, because overheating is a common problem with traditional memory foam. The less-breathable, petroleum-based foam traps heat. Amerisleep mattresses are different. We use our proprietary Bio-Pur® material inside. Bio-Pur® comes from partially plant-based material instead of 100% petroleum. And Bio-Pur® also has an "advanced open-cell structure" that wicks away warm air and keeps you cool. We guarantee you will stay cool and comfortable in an Amerisleep mattress. That's why we offer a risk-free trial for 100 nights. If you don't love everything about your Amerisleep mattress, we'll give you a full refund. Plus we'll arrange to pick up and recycle your returned mattress. Or we can exchange it for one of our other models if you prefer. Most of our customers experience deeper, more comfortable, and more restful sleep from the very first night. But in some cases, you may need time to adjust to the support of your new mattress. Chances are you had your previous mattress for years or even decades. During that time, you developed what are called “sleep postures,” meaning your body got used to sleeping in a certain way — even if it didn’t have proper support. If your body is used to sleeping in a certain posture for years, any change can cause discomfort at first. Even if you’re actually getting better support than before. That’s why it may take some time to adjust to your new Amerisleep mattress. It’s designed to give you proper spinal alignment and pressure relief. But if your sleep postures aren’t used to it, your body will need time to adjust. Once you do though, you’ll be sleeping even better than before. While it’s not required, we strongly recommend you use a mattress protector. We want your Amerisleep mattress to last for decades. (That’s why we offer a 20-year warranty.) And we would hate for an accidental spill to ruin your new mattress. If you need to wash your mattress cover, it has a zipper for easy removal. Wash it with a cold and gentle cycle, and hang it to air dry. You do not need to flip or rotate your Amerisleep mattress. The side with the white Celliant® cover should always remain facing up. Because unlike innerspring mattresses, foam mattresses do not get indentations from repeated use. So you do not need to flip or rotate them. For pillows and mattresses: Shipping in the continental US is always free and so are returns. We believe in fully transparent pricing. There are no restocking penalties, surcharges, or other hidden fees. For sheets, accessories, and flat foundations: Shipping in the continental US is always free. Unfortunately we cannot accept returns for these items. But if you experience a covered defect, we can replace them for free under warranty. For adjustable beds: All adjustable beds ship for free. And if you order an Amerisleep Bed Package, we also include “white glove” delivery, where a local white glove agent will come and set up your new adjustable bed. Adjustable beds do not qualify for returns. The reason? Your new adjustable bed will work with almost any other mattress available on the market. But if you experience a covered defect, we can replace it for free under warranty. Yes, we want you to love your Amerisleep mattress. That’s why we offer a risk-free, 100-night trial. If you don’t experience total satisfaction, contact our friendly support team within 100 nights. We can exchange your mattress for another one of our models, or issue a full refund. Either way, there are no restocking penalties or other hidden fees. We will also arrange to have your returned mattress picked up for you, so you don’t even need to send it back. And as part of our eco-friendly mission, we make every effort to recycle or donate your returned mattress. Find out all the details about the trial on our 100-Night Trial page. Yes, if your order has not shipped yet, we can cancel it for you. Call our support team at 1-800-500-4233 or email [email protected]. We will issue you a refund right away. If your order has shipped, we can still cancel it for you. But we will have to submit a request to FedEx to have your order returned to our warehouse. Once we get your order back, we will issue a refund for you. We accept all major credit and debit cards. We can also accept a direct bank transfer from your checking or savings account if you call our support team at 1-800-500-4233. We do not offer financing at this time. In most cases, your mattress will ship in 3-5 business days. But it can sometimes be as fast as the next business day. And during periods of high demand, like sales seasons, shipment may take longer. Once your mattress has shipped, it will take another 1-5 business days to arrive. To see up-to-date delivery information for a specific product, check the shipping section on that product’s page. Mattresses ship compressed in a box via FedEx. In most cases, FedEx will leave your mattress wherever they leave other shipments you receive. See our Shipping Information page for more details. If you want the ability to elevate your upper body and feet, our mattresses also work great with adjustable beds. Unlike stiff, spring-based mattresses, our mattresses can curve with your adjustable bed as you raise it. That means you still get even support, no matter the elevation of your adjustable bed. If you plan to use a box spring, see the next question for instructions about how to do it with proper support. Can I use my box spring with your mattress? No, compressing the mattress for shipment does not cause any damage. Our mattresses can remain compressed for up to five weeks. It doesn’t impact the quality or durability of the mattress at all. That’s why we can offer a 20-year warranty on all our mattresses. They’re built to stand the test of time — and compressing them for shipment doesn’t change that at all.